Experience the dance of the starlings across the evening sky! The ballet of the starlings is an extraordinary experience. The phenomenon "Black Sun" is a magnificent display across the evening sky, when 100.000-300.000 starlings gather to roost in the reeds in the marshland. The almost magical formations of the murmuration of starlings depend on the presence of birds of prey, as they hunt the starlings in the fading light. 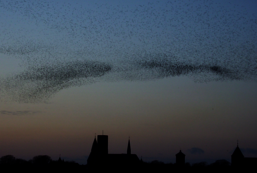 The Wadden Sea Centre guides follow the starlings in the days before the tour in order to know where the starlings are most likely to settle for the night in the Wadden Sea National Park. There are, however, no guarantees with regard to nature. No one knows how the evening will turn out - but that is what makes it all so exciting! One adult can bring two children (0-13 years) free of charge. We will stand still waiting for the starlings for a long time, so dress warm with hat, woolen clothes and rain clothes. Also bring coffee, food and something to sit on for the waiting time.. Sat 7 September 2019, 6 pm.